Like I mentioned in my earlier posts, UCEED is a newly framed exam and so, it's quite complicated to realise the proper way to prepare; since it's even difficult to understand what topics to be covered and how to prepare/practice. Keeping this in mind, I came up with this post, (Like I did for CEED exam) so that, you would get some idea and prepare/practice accordingly, without ending up practicing in improper way. I thought that at least a small part of this post would benefit you in some way, that's why without thinking, shared here. More than 30% of the topics in CEED exam depends on your sketching work. Sketching level for CEED should be at least average, (note that a starter can pick up his skills in due course of time - once he get into CEED process) but fortunately, sketching or any kind of drawing/illustration are not required for UCEED. Once you get into bdes, you will be guided by the instructors during your course work regarding illustration/sketching or you may go at your own phase. If you are a starter and you have very less hands on experience in sketching, but you do have immense interest towards design, then also don't worry. UCEED will probably be structured to test candidates ability. The ability could be any/all of mathematical, design, mechanical, observative and imaginative nature. But, do remember that it is your 'common sense' that helps you the most! Common sense and practicality are what is needed even for every designer. So, while facing questions, do apply your common sense initially without going for theory or crude way of solving. If that doesn't turn out, and if the questions (other than GA) are like, they need some formula or something, then only look/try with the theory you know. You might have observed that I stressed the importance of geometry and illusive type questions by including more questions/links related to solid manipulation etc in this blogs resource page. The reason is obvious, if you have a good grip on geometry manipulation, then you will definitely have good imaginative power. Observation, visualisation and imagination are mutually inter-related. These topics could be considered as a set. So, if you wish to improve your imagination (which included V and O) badly, then do try your hands on geometry and image type questions. If you have time, then take as many exercises as possible, (that I have included in resource page or get it from the internet) and make yourself comfortable with these areas. To be honest, whenever I get the crazy feeling like - "how come I'm able to cover these topics ?" then I would end up with the answer - 'because I'm some what better at geometry manipulation and brain teasers'. Forget about my GA - because I'm damn bad at memorising things unless it involves some analysis! By now, you must be aware that reading comprehension, synonymous, sentence completion, are some of the topics that has to be covered for UCEED. Practising this from the very beginning is recommended for those who are average in English (like me). You need to be fast in attempting language and comprehensive questions, which might consume much of your time during exam. There is no other option other than going through practice exercises. It's a fact that humans learn from experience and through practice! Don't indulge yourself much into current affairs and GK studies. It's not worth spending much time on these topics that could consume much of your time for just some questions (unless you already have good grip). Questions that covers general knowledge, current affairs, commonly used materials, designers, artists, animation (movies, technology, directors) etc requires you to memorise and so it's better to focus on such topics at the end of the practice. I mean, plan these topics before a week (or so; based on your capability. I prefer two to three days before the day of exam). Let me tell you my case - why I did like that ? even if I prepare and cover GA topics before a month (say), then also I will have to revise/recap the same topics some time near to the exam day, kind of double work! agreed ? So that's why I planned and chose to study two days before the exam, (since I had ready made materials, I didn't invest time for resource gathering, that's why felt confident of my two-day plan). Alas, it worked for me ! Let's discuss about your case, if you have quite a good number of GA resources with you, and if you are like me - need recap even after going through those topics once or twice, then better stick with the plan of covering these topics before a week or so. Just make sure that you get hold of those materials, else you need to start gathering those topics (since no collections or books are available for UCEED). I've tried to cover as many topics as I can, in this blog, you may use that, if you feel like you need more topics or more materials for the same topics hat is included in this blog, then better start gathering them by searching the web or in reference books. Reasoning questions are just like brain teasers or it's kind of geometry type questions (we just saw (above) - how to deal with these topics). As far as possible, try practising these questions everyday, right from the day you started your practice. You cannot/should not expect to develop Reasoning and Imagination skills over night ! That is not recommended and of course not possible ! Design GA in the sense - photography terms, logos, art and design related terms, famous personalities, can be considered as a one time study topics. So, these topics could be included in your regular time table. Like I mentioned earlier, since these topics are available, so there's little need for you to worry about material collection. You may go for additional topics once you cover those that I have included as well as some other materials that you got somehow. Although this is the hottest topic in the present scenario; (in the sense that this area is bothered in almost every field - be it is design, engineering, medical, corporate etc), but very few questions are appearing in UCEED exam in this area. So, it's ok to spend less time on this, but more on non-verbal and reasoning part. Which part of the environment does it affect (water, air, forest, animals ..... so on). How does these changes takes place. How is that identifiable ? What is the manufacturing process and what effects it has ? what will be waste produced ? Although, these questions seem out of scope and hifi for us, yet thinking this way, and knowing about the basics of the materials/process and their side effects would provide some idea for us and help us for UCEED. Concern towards environment and sustainability will help your career too. So, be on it. I received a query from our blog friend, whom wants to get a strategy for writing (during) uceed exam, in the sense, which type of questions to attempt, how and in what system/order ? In this regard I just thought of sharing this to everyone, so that others would also benefit from this. Numerical questions (esp. puzzles and aptitude ques) are time consuming while picture type questions are time savers (if you are able to solve them!). You may judge yourself whether your solution went correct or not (in most cases). That's why I insisted every one to practice more on picture/geometry type questions so that you would save your time as well as help solve other similar questions, rather going on tail and error basis for others (like English, GA etc) - which happens in most cases. Remember the negative marking feature in UCEED! (other reason being picture (image/geo) type questions opens your imagination skills). So, if you are really good at common sense type questions, then start working on them during exam. This helps you to navigate to the desired question as and when needed; within the time limit (within 3 hrs). So , I think its not a problem if you leave behind some questions for later review. But make sure that you dedicate some time (at the end) to review the left behind questions or go through those questions that you haven't tried yet. I usually do like this - fortunately most of the other exams have section wise topics. So, I try the sections that demands trail and error feature; as last part. Most of the times I end up with just 15-10 mins, which of course is not a good practice though. By practising previous ceed papers as well as uceed model papers, you should have understood your level. This should have given you an idea about which areas you are good at and which area you need development. Hoping that you tried your hands on the topics which you felt like needed development, you now know more about the subject and you can judge whether you are still lacking behind (need improvement) or you are able to pick up in course of time. If in case you are still stuck with some topics even after practice, then better leave those questions without attempting during exam, but be sure that you are sufficiently prepared for other topics! Negative marking is the biggest bothering feature in CEED as well as in UCEED. So unless you are not sure (probability is less than 50%), don't jump to answer those questions. This is weird! I should have written on how to solve questions with tricks, but instead I'm giving how to manage time and deal with negative markings. As the topics are diverse, it's difficult (and almost impossible) for any one to cover each and every topics through blogs. So that's why, you have to cover those topics (like different types of aptitude questions etc) by yourself. 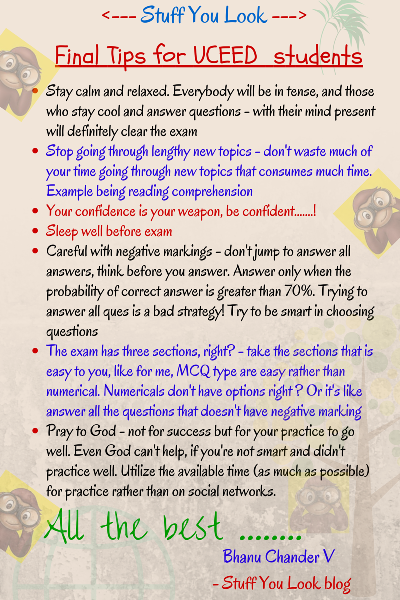 I know this is not proper (giving time tricks), but since I had experienced the pain of over marking negatives in exams, I thought it would be better if you mind the questions properly. Hope this is of some use to you ! Sir do you have any knowledge about the cutoff for the UCEED exam? Thank you very much bro for the writings, and sad to hear that you didn't get help as expected from institute. Anyway, I'm just saying, since you've paid for the course, check with them if they can provide you any additional materials or plans for your preparation. thank you so much.. all these question papers are really good thanks for uploading them.. i have attempted all the papers that u have uploaded related to uceed.. i hope that it helps me! Hello, I am currently pursuing my masters in Civil engineering, IISc. I am very passionate about product design and I want to pursue a full time M.Des. course in IISc. I am planning to take CEED exam this year. Please guide me with the topics that I should focus on. But ...wait....... u said u r a prospect masters student, then why u want to take one more masters course ? don't u think u will be spending 2-3 more additional years for the course. If you are so passionate, then why don't u go for P.hD ? How can i practice daily for uceed xam. Which topic i study regularly? design aptitude part is the one that you should be focused much as your daily practice. It's obvious, you could have noticed the number of aptitude ques (image based) in prev papers. So, sharpen your visualization skills by going thru very good no. of examples. Also, GA part CANNOT be neglected, coz that's where people r loosing marks. So, at least once in three days try to cover some portion of GA. Although full-fledge study on GA during the last three weeks of UCEED exam is highly recommended. That's when you remember better than studying very early. I'm reading your blog from my college library. "Engineering college" library. I guess I don't need to say why I'm looking at UCEED stuff when I recently got admission here...I just don't belong here! I was feeling so down and suffocated till I came across your blog. It instantly brightened my day.I always had a keen sense of design, I was always inclined towards it. but I chose BE, just because...idk why. Now I'm thinking of appearing for UCEED 2017 and hopefully make it to IITB or IITDJM. You're blog is a godsend. Thank you so much! Sometimes, we need to move on in the sense that may be a better future is awaiting you. If not BDes you have MDEs option after your BE. So, Instead of leaving and wasting one year, may be you can look for this option of MDes. Or of you don't have issues, then you may try for BDes by appearing in UCEED'17. But again, don't leave BE immediately, try to give exam by being in ur BE and once you get good rank suitable enough to take you to your desired institute, you can drop your BE course. Anyway, you don't have to regret for ur current state. Things happen for good only! Be positive. Good luck. Bro, same was the case with me. And I gave UCEED in '16. Didn't get a rank. Also I practiced from this very same blog. This blog is really godsend. But now I am in engg. And am really enjoying it, although the first two months were the most depressing! So try to cheer up. Once you've taken engg. Don't leave it immediately. Try for CEED. And as Sir said "things do happen for the good". All the best. i am akhilesh from bangalore currently doing my 12th(science group). i have a lot of interest in the field of design and exams like UCEED and DAT are coming up. Given the time limit of, u can spend 2 hours a day (or even less) based on your level, since you have to cover board exams as well. My suggestions is spend rest of the time left after your regular board exam preparation, for uceed, everyday. Design aptitude is what u shld be concerned first coz u get several such ques as wel las u can answer them with confidence unlike GA which if u r not sure, then u will be in 50-50 chance, danger of even getting negative markings, so try to develop ur aptitude, keeping regular touch with GA.
Sir , which is the best way to approach the Mental Ability and numerical based questions? Is there any reference guides or books to sharpen up? It's mostly based on observation and application of your mathematical ability for the questions. It can be attained by practice. If you're not that good, then start by going thru the answers for such ques n try to understand how it was solved. Going thru answers for diff such ques would help u implement for similar ques. Only thing needed is your effort n time in that. u have sufficent time for ur prep, uceed practice doesn't take much time if u plan/schedule properly as well as go through selected and necessary topics. The above whole post is to answer ur ques 'how to prepare for exam'. Like I mentioned, give more emphasis to aptitude, by aptitude i mean more of deign aptitude that included image kind of question, ques on images testing ur observation, different views, identifying patterns (mechanical, spatial, visual ability including picture reasoning). The tough level of uceed is more than ceed exam for mdes. So, u shld be quick in solving questions for which practice is needed. Start with the topics (listed above as well as some of ur own) and also as a start attempt the previous papers to get an idea of which kind of questions are asked frequently and with what %. There isn't any shortcut for preparing to GK as u must be knowing, but focusing more on design related GA would shorten ur prep time. U can get the list in the resource page of this blog. Some students also found that solving NATA related questions (and preparing for that) helped them for uceed too. So, apart for just uceed, try giving more exams too like nid, nata, nift, jee mains 2 etc for safer side. Good news is some of the topics in all these design exams are same and so u don't have to put separate effort for each exam in full fledge. Also, ur preparation should be proper, it's not good if u say start with uceed for the next couple of months, complete it, then switch to say nift, prepare only that neglecting other exams and like so. It might not be helpful to u. U will forget the topics or the flow with which u answered the ques, so ur prep shld be parallel for all the exams. I can suggest u one way, solve at least one previous paper of all the exams u r aiming for, see which topics u felt difficulty in all the exams (forgot about the marks u scored), then u will get to know which exam gfelt easy or difficult like say nid is mostly awareness kind with less of math apti, while uceed needs very good funda on observation and prob solving. Knowing ur key shortfals u can schedule ur weekly or monthly timetable. Like say if u found uceed to be tough for u, then it should be like if u spend the whole week for topics prep, u may consider spending oncee in a week the topics which is not covered in ur regular prep but is asked in other exams like say NID. Hope u got it. U have sufficiently 7-8 months and I guess u also give 12th board which make sure that u will not neglect that. Based on that I can say in a day 1-2 hours for the first few months (say next three months) will be sufficient. But u shld know which topics is best to prepare in advance. Check my timetable to see the priority list, whichever topics are in the earlier months are priority in the sense they need pre practice which takes time. And the next thing, don't ever tell me that 'I'm average' I hate that sounding. There is no notion of avg student, it's just a matter of choice, probably u r skilled in sports, design, other skills like research, marketing etc but not much interested in theoretical study! so, u shld not feel that way. Thing is look into ur passions and if u move in that direction, u will make wonders and will stand out of the crowd. Do things which interest you, not that which interest ur parents or that interest in money nor that bring fame or recognition. Many studnets by mistake join engineering in IITs or other colleges just looking into the name tag and later regret for taking wrong decision. If you have passion for design, then u will perform well (top) in design field, but again don't get judged by the marks, I literally not agree with the exam pattern, as they r not upto the mark in evaluating the skills of students. So, the best thing u can do is keep urself motivated and be positive to take things and keep tying even if u feel u r not good but having interest. I hope u take my words positively. All the best chotu. sorry sir for disturbing you so much bt cn uh help me solve this no. series.........? It has to be a +2(not -2) to make a series. Sir please explain colors and its theories in detail in your next post for uceed and nid! Also, explore, NID, CEED resource pages to get more related materials. sir... i am totally interested in designing ..but i am worried about future is there any job opportunity and what will be the salaries. If u put serious effort, spending time on topics, u can study them for sure. Only thing is u need commitment and confidence that u can cover m clear the exam. One suggestion instead of looking at lag he topics at a time, choose some selected priority topics for couple of months n cover them, at least that way u can avoid ur nervousness as it will build condfidence. Good luck for ur exam. hello sir ! i just gave nid entrance yesterday . though the paper was easy i was not able to complete all mcqs though i knew that time is very less . it am feeling really very bad as i took arts 11 th 12 th to persue my career in design. i am also giving uceed . so how to manage time for the exam especially the mcq part . plz guide me sir . Hello, sir I want to do design because it has more scope then btech. can you elaborate it ...???? Am i right or wrong???? sir, can i get better placement after b.des from iit??? better placement means working in a good company. sir im giving uceed in 2019 i am obc category ..how much should my category rank (approx) so that i get admission into iit bombay or iitg? If I say only 50 marks would you restrict yourself to 50 marks? Is that fair? There is no point of targeting or knowing the cutoff. Just give ur best and aim for first rank. After u get the rank, think further on which college to choose. I’ve written something relevant to your query in this page. If you are not clear even after reading that, you can write back to me.